Are you looking for a natural pain relief product that works? 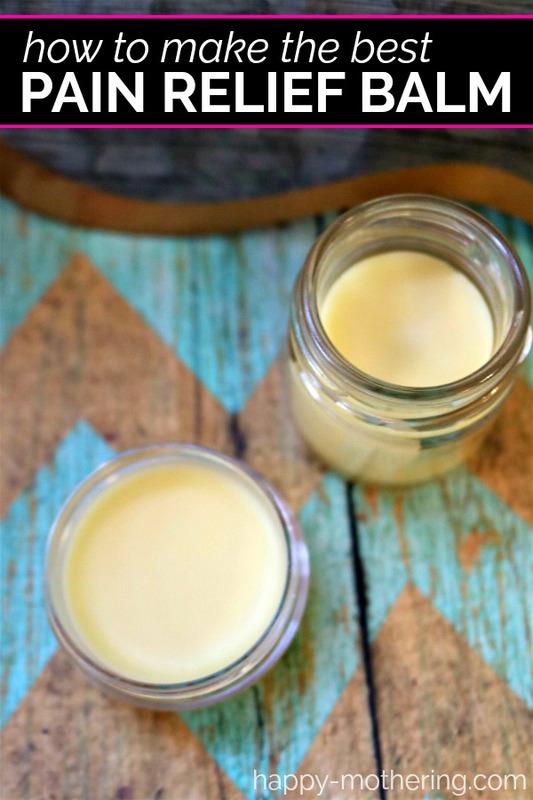 Learn how to make a natural DIY pain relief balm that smells amazing and works great! Most people deal with pain and discomfort of some sort. I love whipping up all sorts of essential oil blends to help with aches and pains. 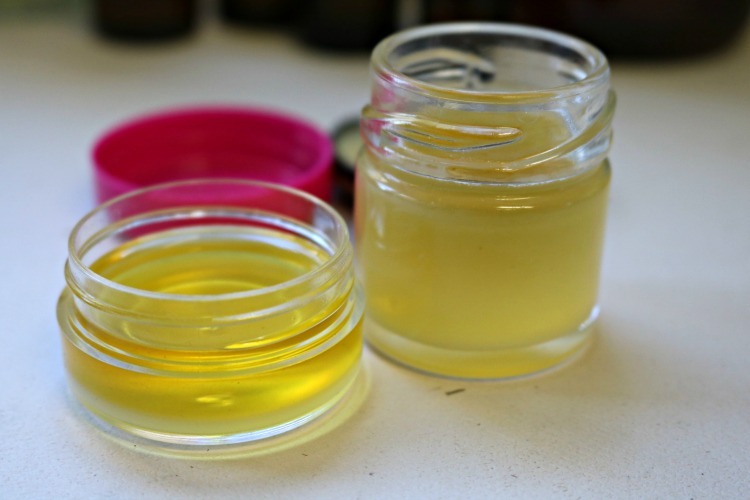 You can buy a pre-made natural pain relief balm – or you can make your own. This recipe focuses on two primary essential oils – frankincense and mint. Frankincense and mint essential oils are both wonderful for so many health issues we struggle with. If you use essential oils on a regular basis, then it is likely that peppermint and frankincense are in your favorite and most-often used oils. Frankincense has powerful qualities that are wonderful for the skin, and has been used for centuries, dating even back to the Ancient Egyptians. 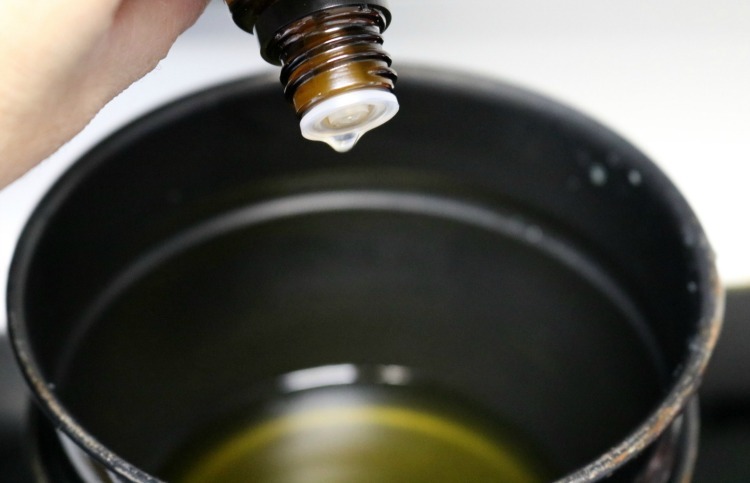 It is the perfect essential oil for making a balm because it is nourishing the skin, but also brings other properties as well like cleansing and soothing. 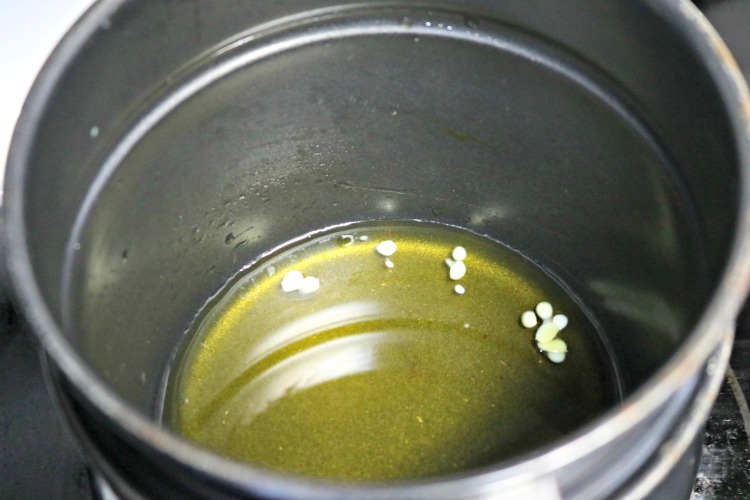 You can use mint oils for tummy troubles, pain relief, to cut down on inflammation and much more, so it made sense to me to create a natural pain relief balm that I could use on a regular basis that contained these oils. I decided to try the combination of the frankincense with a trio of mint oils, instead of just one. The wintergreen is one that is frequently used for pain and it works so well for inflammation (it’s an affordable substitute for Birch essential oil). So it is great to use both, but the peppermint and spearmint have the same function and, when used together, they create such a sweet scent that balances out so well with the frankincense oil. The great thing about using a balm instead of just the oil itself is that is stays put on the area much longer. I apply this to sore muscle areas that are strained or tired before bed. That way, it has time all night to work on me while I am still, but during the day it stays put, whereas the oils don’t stay as long. They still work well, don’t get me wrong, but this is another way to utilize them for deep pain relief. 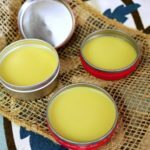 If you’re looking for a natural pain relief product that works, try making this DIY Natural Pain Relief Balm! And be sure to let us know how you like it in the comments below. 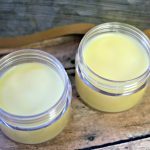 If you’re not up for a DIY, you can buy a pre-made natural pain relief balm on Amazon. Fill your double boiler’s bottom half just over half full of water and place on low to medium heat. Then, measure out your beeswax and add to the top half and place on the stove. Bring the water slowly to a boil, stirring the wax once or twice to break it up if it sticks together much. You should do this process slowly and not bring it to a fast boil, so that you don’t burn the wax. You will lose its valuable properties if it gets too overheated or burned. Once you hear the water (not the beeswax) starting to boil, turn it way down to the lowest setting. While that is coming to a boil, you can measure out your coconut oil and have it ready. You can also get your containers set out and ready for filling. The coconut oil does have a tendency to solidify if it gets cool, so if that is the case, put it in a bowl of very warm water and it will liquefy enough to easily pour. Once the beeswax is clear and melted, add in the coconut oil. Then, measure out the sweet almond oil and add it to the mix as well. Give these a stir and once they are melted, which doesn’t take long at all, stir together to blend well. The next step is to add in the essential oils. Each one of these oils is a thin consistency, so go slowly when adding your drops! Now stir the mix all together and you are ready to pour. Fill your containers to just below the rim and leave off the lids for now. Let the balms cool and solidify at room temperature until they are fully cooled off. Feel the bottom center of the containers after about 30 to 45 minutes to test them. For the larger containers, like the 2-ounce size they will likely take about an hour. Once they are totally cooled off, you can put the lids on and just make a nice label if you’d like, and you are all done! Take a pea-sized amount of your natural pain relief balm and rub into area that is sore or uncomfortable. Reapply as needed. For severe pain or strain, you can apply the essential oils on top of the balm, layering for an even deeper effect. 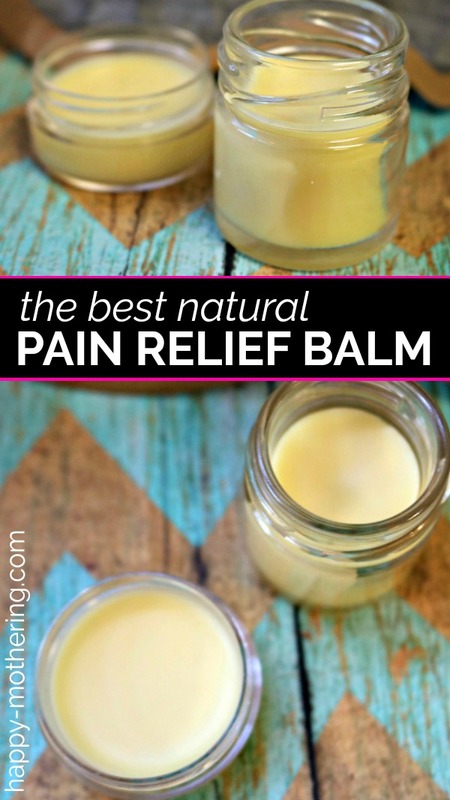 I hope this natural pain relief balm works as well for you as it does for us! If you’re looking for a shortcut, you can buy a pre-made pain relief balm. 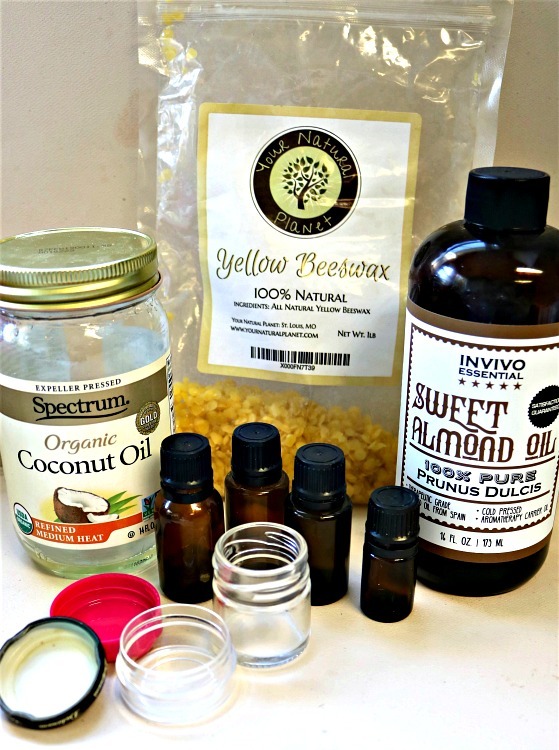 What’s your favorite way to use this DIY natural pain relief balm? 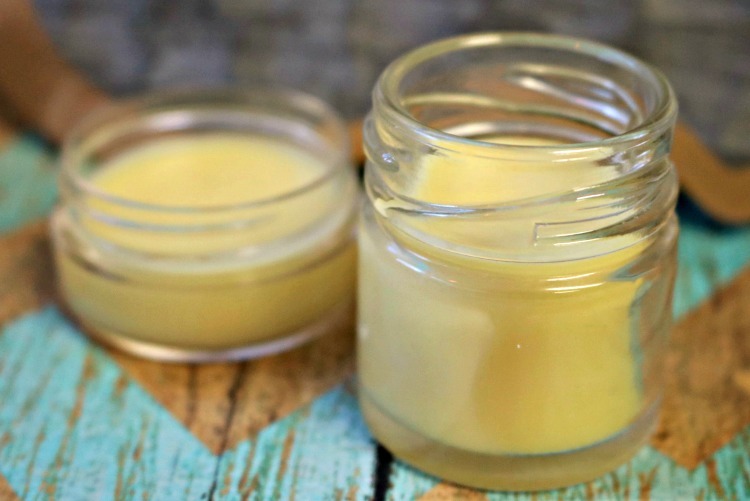 Pin this Natural Pain Relief Balm to Your DIY or Remedies Board! I made this, and it came out solid as a rock. The only way I can get a pea-size amount to rub in is if I chisel it out with a knife. I weighed out 2 ounces of beeswax. Is there any way to fix it? Maybe melt it down again and add more oil.? Help! Yes, you can absolutely melt it back down and add more oil. You could also add some shea butter instead of oil. Hello, thank you for sharing, I really wants to make this pain relief but i don´t have right now wintergreen can I susbtitute for another one, I do have frankinsence, mint and spearmint, between others, please help me. Thanks… sorry about my grammar still learning english. could I substitute another oil for the coconut oil. I thought I had some but it is white solid and not oily. You can melt the coconut oil or use another type of oil like olive oil or fractionated coconut oil. I have been suffering from arthritis lately on my knees and have tried everything but nothing has helped! Last option was physio therapy then I came across your recipe and thought why not… and made 3 little jars of balm and started applying it everyday within 2 days I felt the results my pain started reducing and today after 9 days it’s almost gone! That’s amazing to hear! Thank you for sharing your story!